Yep, that’s what I found. 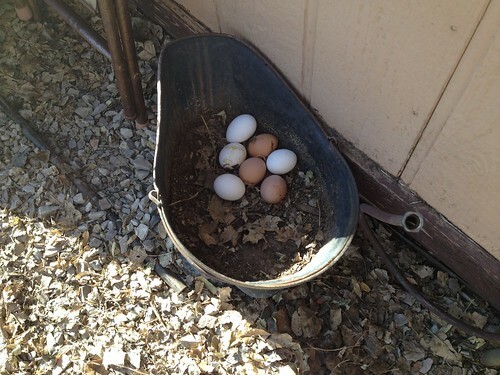 This is a coal bucket that I’d used as a planter this summer, and it had apparently been the perfect place for those hens to drop their eggs! 7 of them!! What?! I was kinda tempted to keep them… you’d understand if you’d ever raised chickens for eggs, ha ha!… but one was cracked and even though it’s been cold, I’d be reluctant to eat them after they’d been “out” for a few days. *sigh* I did keep one. 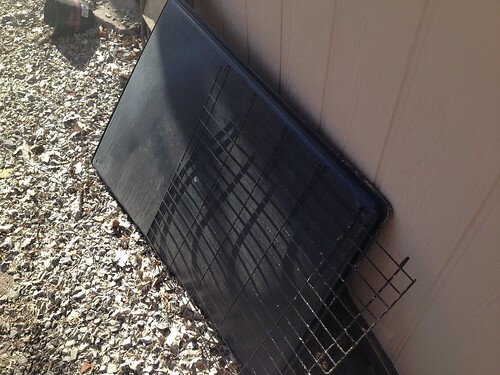 It was still warm which meant it had only recently been laid. 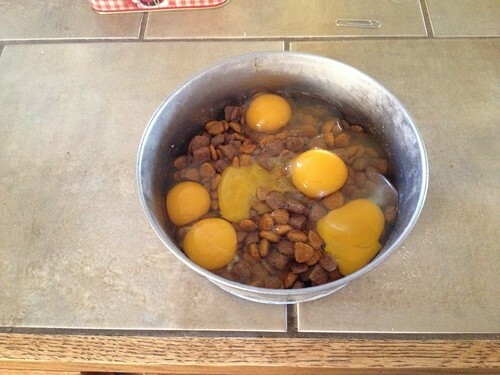 The rest the dog will get for supper… lucky dog! Once I “broke up” the nest everyone loves best, by moving the plastic tray and even relocating the bucket, there was one rather clueless but determined little Road Island Red that kept running up and down the side of the house looking for the nest. I tried to catch it, thinking I could set her on the “real” nest and she might figure it out, but no, she wasn’t in the mood to be “catched” of course. So I chased them all out of the backyard, and closed the gates on them. I’d like to think she’ll give up and go lay her egg in the coop, but I just looked out the FRONT windows and she is still frantically running along the siding looking for that nest.